The second epistle of Peter was written at a later time of his life, generally thought to be written shortly before his death. It is at a time where eyewitnesses and first-hand testifiers of the majesty of Christ are dwindling in numbers, and one can imagine that if these firsthand witnesses are all gone, those left behind may be extremely vulnerable to the false teachings and the temptations that surround them. In this letter, Peter attempts to stir up his audience and inspire them to grow cautiously in faith, not by teaching them anything new, but by reminding them what they already know. So I will always remind you of these things – what are these things? Looking into the context of this verse, we can safely deduce that ‘these things‘ mentioned in verse 12 are the same as ‘these things‘ mentioned in verse 10 – For if you do these things, you will never fall [2 Peter 1:10], and refers to the things mentioned in verses 5-7 – make every effort to add to your faith goodness; and to goodness, knowledge; and to knowledge, self-control; and to self-control, perseverance; and to perseverance, godliness; and to godliness, brotherly kindness; and to brotherly kindness, love. even though you know them and are firmly established in the truth you now have – I know you know them, I know you’ve heard this many times, and I know you don’t just know them, but you’re firmly established in the truth. Even so, I will still remind you, and I won’t just remind you once – I will always remind you. We see the importance of reminders here – especially so in the context of the early Church. As time passes, fewer and fewer people who have seen Christ firsthand are around to speak of their testimonies. These people are those who are able to say this – We did not follow cleverly invented stories when we told you about the power and coming of our Lord Jesus Christ, but we were eyewitnesses of his majesty [2 Peter 1:16]. When they leave, firsthand testimonies become second-hand at best, and those who are weaker in faith may easily doubt the credibility of such second hand tales. 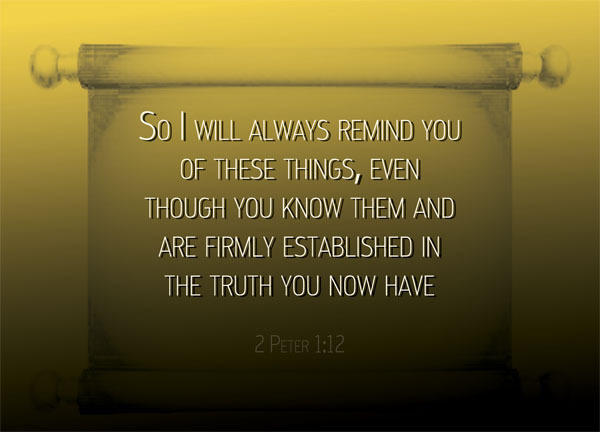 Peter thus resorted to the method of reminder in order to encourage and inspire his audience. Today, reminders are equally important to us. Some of us pride ourselves in being Christians for decades, knowing the word well, and understanding the doctrine relatively well for a regular Christian. Even so, we need reminders, because temptations never stop knocking on our doors. The devil never stops his attacks – for the accuser of our brothers, who accuses them before our God day and night [Rev 12:10]. Even if we know, even if we profess to have unwavering faith, we never stop needing reminders. Whether timely or untimely, they will always only ever help to point us back to God. Who are we to exhaust the knowledge that is in the Bible? Even though we know, we merely know in part. Even though we seem to understand, we never understand fully. With every reminder, the gospel is confirmed more and more. Why do we memorize verses? I personally memorize so that should the day comes when I need a particular teaching, I will recall the verse and be reminded. Maybe when I’m being haughty, I will suddenly recall Romans 12:16 and be humbled. If you’ve been a Christian for some time, surely you’ve been to a sermon or a conference where 80% of what the preacher says, you’ve either heard or read before, and you perfectly understand. Is that a waste of time, then, since technically speaking, there is no improvement in your understanding of God? If in the secular world, it would certainly be a complete waste of time. Someone who already knows how to change the tyre of a car would not sit through an hour’s lecture on how to change a car’s tyre. But in the spiritual realm, even if its something that you’ve heard of again and again, it serves as a reminder – not because you will forget, but because it gives you another opportunity to reflect and to give thanks. It’s like why we read the Bible again and again, day after day, year after year. I personally don’t have the habit of reading a book more than once (other than those I had to study back in school), but even if you do, surely you don’t read any book like you read the Bible. If you do, then maybe you need to read the Bible more. The entire Bible is teaching. The entire Bible is reminding. We learn new things from old passages; and even if we don’t learn new things, we can perhaps regain old hope and confidence that have been slowly blown and grinded away by the winds of life. how wise you are, sweet girl.